Russian publicist; born in 1852; son of Ḥayyim Selig Slonimski. At the age of twenty he began contributing sociological and legal articles to various Russian journals, and since 1882 he has been a permanent contributor to the "Vyestnik Yevropy." Some of his articles express his opposition to the fiscal policy which tends by artificial means to further the enrichment of capitalists to the injury of agriculturists and laborers. He is an opponent also of the teachings of Karl Marx and his followers. 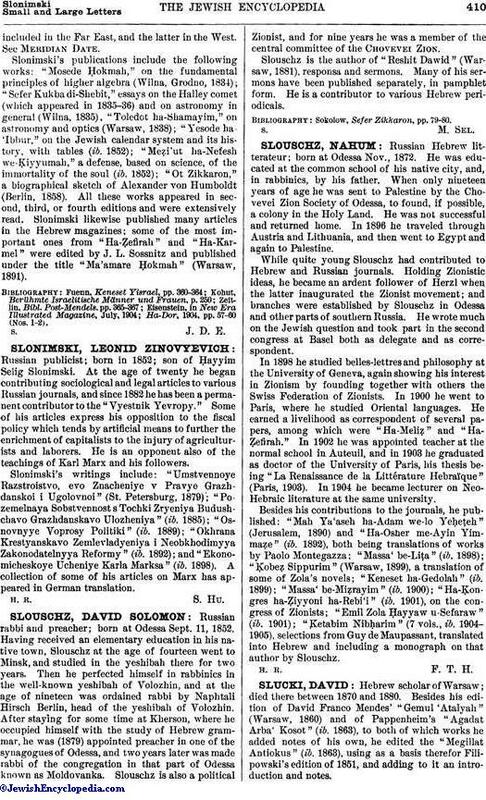 Slonimski's writings include: "Umstvennoye Razstroistvo, evo Znacheniye v Pravye Grazhdanskoi i Ugolovnoi" (St. Petersburg, 1879); "Pozemelnaya Sobstvennost s Tochki Zryeniya Budushchavo Grazhdanskavo Ulozheniya" (ib. 1885); "Osnovnyye Voprosy Politiki" (ib. 1889); "Okhrana Krestyanskavo Zemlevladyeniya i Neobkhodimyya Zakonodatelnyya Reformy" (ib. 1892); and "Ekonomicheskoye Ucheniye Karla Marksa" (ib. 1898). A collection of some of his articles on Marx has appeared in German translation.